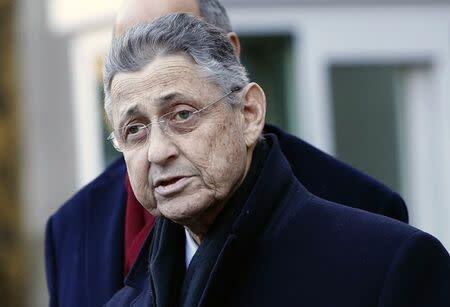 NEW YORK (Reuters) - New York Assembly Speaker Sheldon Silver, one of the state's most powerful politicians for more than two decades, was charged on Thursday with pocketing $4 million from bribery and kickback schemes. Silver, a Democrat who has served as the highest-ranking state assemblyman since 1994, was accused in a federal criminal complaint in New York, as authorities moved to seize $3.8 million in proceeds tied to the alleged corruption. The 70-year-old Silver, a licensed lawyer who represents Manhattan's Lower East Side, is known as one of Albany's three most powerful men, alongside Governor Andrew Cuomo and Senate Majority Leader Dean Skelos. He has been a leading voice in years of negotiations over state budgets and key legislation. The Assembly canceled its Thursday session following Silver's arrest, less than two weeks after the new legislative session opened. Silver would lose his seat if convicted of any of five felony counts and faces a maximum of 20 years of prison on each count. He became the latest addition to a long line of New York politicians implicated in corruption scandals. 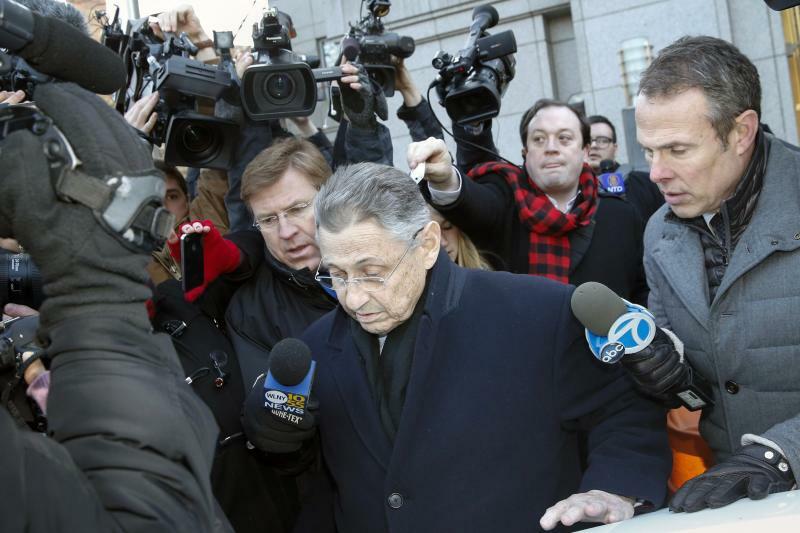 At least 30 New York politicians have faced legal or ethics charges since 2000. "As today's charges make clear, the show-me-the-money culture of Albany has been perpetuated and promoted at the very top of the political food chain," Manhattan U.S. Attorney Preet Bharara told reporters. At a brief court appearance on Thursday afternoon, a judge released Silver on a $200,000 bond. Asked for a comment outside the courtroom, he said, "I am confident that after a full hearing and due process I will be vindicated for these charges." Despite some calls for Silver's resignation, Albany Democrats emerged from a private meeting on Thursday to declare their support for him, with Assembly Majority Leader Joseph Morelle saying the members "overwhelmingly" stood behind Silver. Cuomo has not commented on the arrest, but said in an interview with the New York Daily News that it was "a bad reflection on government," adding that he didn't know enough to form a judgment about the case. Another prominent Democrat, New York City Mayor Bill de Blasio, said he did not think Silver should step down, citing his "due process rights." "In my experience with Shelly Silver, I've seen integrity and public service," de Blasio told reporters, according to a transcript released by his office. In 2013, Cuomo launched an anticorruption panel called the Moreland Commission to probe wrongdoing in the state's capital. But he abruptly shut the commission down in March, drawing criticism from Bharara, whose office took possession of its files to continue any investigations. The commission's work was merged with an ongoing federal probe of Silver's outside income initiated in June 2013, the criminal complaint said. Silver had long listed New York personal injury firm Weitz & Luxenberg on his financial disclosure forms as a source of income for representing its clients in cases. But the complaint said over $3 million of his income was for referring asbestos sufferers from a doctor whose research had been secretly provided $500,000 in state funds at Silver's direction, as well as other benefits. Prosecutors said Silver also received $700,000 in kickbacks by steering real estate developers with business before the legislature to another law firm, identified by its defense lawyer as Goldberg & Iryami. "He simply sat back and collected millions of dollars by cashing in on his political office," Bharara said. Weitz & Luxenberg in a statement said it had cooperated with the investigation and was "not aware of any improprieties whatsoever." Michael Ross, a lawyer for Goldberg & Iryami, declined comment on the allegations. The complaint did not name the doctor but said he had created a mesothelioma research center at a New York university hospital. Details in the complaint match those of Robert Taub, a professor at Columbia University. In 2011, the assembly passed a resolution, sponsored by Silver, honoring Taub for his contributions to mesothelioma treatment. A spokesman for Columbia said it had no knowledge of the allegations and will cooperate with the investigation. Taub did not respond to a request for comment. After surrendering to authorities in lower Manhattan at about 8 a.m., a somber-looking Silver headed to nearby federal court, wearing a dark suit and a black hat, his car mobbed by reporters and photographers. "It is unfortunate that the prosecutors chose to pursue this as a criminal case," Silver's attorney, Steven Molo, said by email. "We intend to vigorously contest the charges and Mr. Silver looks forward to his day in court." Silver's longtime Senate counterpart, Joseph Bruno, was acquitted in May at a retrial on bribery charges. One of Silver's predecessors as speaker, Mel Miller, was convicted of corruption in the early 1990s, but the conviction was overturned by a federal appeals court. Two former state Senate Democratic leaders, John Sampson and Malcolm Smith, are also facing criminal charges.